Well, I finally found my way into a show Downtown. I don't know why it feels like such a BIG DEAL to me, but I'm excited! 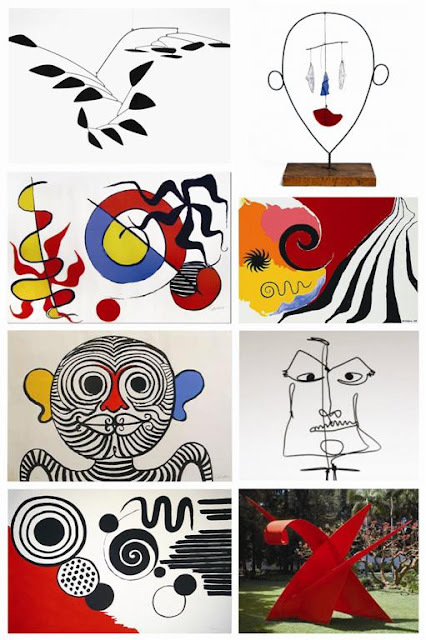 This is a group exhibition of work inspired by the Mid Century Master Alexander Calder. I enjoyed studying his art and eagerly took on the challenge of creating my own homage to him. I referred to the above images as a jumping off point and tried to come up with something that borrowed a few of his design elements while still trying to allow my own 'Style' to show through. Although I don't feel like I have found my artistic voice yet, I do know that I like the look and feel of painting on wood and I'm hell-bent on incorporating found objects. I'm still on this music kick as you can see by the guitar picks and tuning key and for this one, I even cut up a record . . . that was fun! I've named this clown 'Xeno' from the Greek Xenos meaning Stranger. 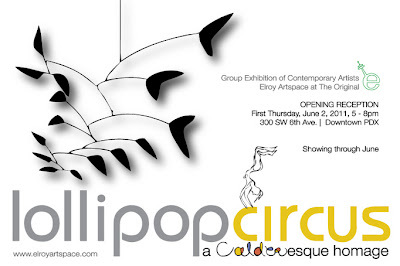 You can check him out at the opening on 6/2 -my First 'First Thursday'! there must be something in thwater in Portland that producesso many amazing artists!